Just wanted to say, I’m really enjoying the blog posts that are coming out of the questions folks ask me via email; please feel free to send me any questions about writing, publishing, cosplay, being an acafan, or anything else, and I will be happy to answer as best as I can here! Yesterday I talked about techniques for how to keep your bum in your seat and your fingers on the keys and finish your book. Today I’m going to get a bit more basic and talk about how to tell a story. This might seem obvious, but there is a large danger in genre fiction (especially fantasy) that people are so focused on the world building that they forget that the story has to be about one person, a person on whose shoulder the reader rides and whose thoughts we get to share. What makes a story compelling is the journey we get to go on with that one person, the hero/anti-hero/protagonist. Something amazing happens to them, and we get to experience it with them. The villain/antagonist appears to try to thwart the hero, and we want to be a part of the epic struggle they go through in order to achieve their wants and desires. The world around the character has to be rich, of course, so world build away! The world needs to be filled with scents and sounds and textures, with cultural institutions and a weighty history of culture and civilization – but it has to be revealed through the eyes of the characters. The great danger of drowning in worldbuilding so much at the beginning is that it becomes an exposition dump that impedes your ability to actually start the plot. The best way to avoid this is to cut it out entirely. I know, it’s painful to think that your perfectly crafted treatise on why the world is in the political situation that it is would be cut out, but it’s necessary. Start your novel when the story starts. Start when the bullet leaves the barrel, when the king is slain, when a messenger from the regent comes and tells the miller boy that he is being drafted for a war with foreign wizards, when the aliens crash-land on Earth, when your heroine meets the love of her life and watches him walk away with another girl, etc. Put the world building AROUND that stuff. Use the plot to tell us about the world as your hero interacts with it. It is a truth universally acknowledged that a single man in possession of a good fortune must be in want of a wife. ALREADY WE SEE THAT AUSTEN IS SETTING US UP TO THINK ABOUT MARRIAGE, AND THE DESPERATE FOCUS ON AN ADVANTAGEOUS MATCH. AS THIS IS THE THEME OF THE BOOK, IT IS VITAL THAT SHE GETS ACROSS IN THE FIRST SENTENCE THAT THIS IS WHAT SHE WANTS THE READER TO BE THINKING OF. However little known the feelings or views of such a man may be on his first entering a neighbourhood, this truth is so well fixed in the minds of the surrounding families, that he is considered as the rightful property of some one or other of their daughters. AH, OKAY – SO NOW AUSTEN IS GETTING US TO START THINKING ABOUT HIGH SOCIETY MAMAS WHO ARE FIGHTING ONE ANOTHER OFF TO MAKE SURE THEIR DAUGHTERS MARRY BEST. “My dear Mr. Bennet,” said his lady to him one day, “have you heard that Netherfield Park is let at last?” WE KNOW NOW THAT THIS STORY IS GOING TO BE, AT LEAST IN PART, ABOUT THESE BENNETS. WE KNOW THAT HE IS A GENTLEMAN, FOR HIS WIFE IS CALLED ‘A LADY’ –THIS REVEALS THAT THE BOOK WILL PROBABLY BE A DRAWING ROOM DRAMA OR DOMESTIC ROMANCE. WE KNOW THAT IT TAKES PLACE IN THE VICINITY OF A PLACE CALLED NETHERFIELD PARK, AND WE KNOW THAT SOMEBODY HAS JUST RENTED THE PROPERTY. “But it is,” returned she; “for Mrs. Long has just been here, and she told me all about it.” OH, LOOK. MRS. BENNET IS A GOSSIP! Mr. Bennet made no answer. AND MR. BENNET DOESN’T ENCOURAGE THE GOSSIP. “Do not you want to know who has taken it?” cried his wife impatiently. BUT MRS. BENNET HAS A LOT OF EXPERIENCE WITH HIS SILENCES AND HAS SUCH AMAZING GOOD NEWS THAT SHE HAS TO SHARE. “You want to tell me, and I have no objection to hearing it.” AH, MR. BENNET IS DROLL AND LONG SUFFERING. “Why, my dear, you must know, Mrs. Long says that Netherfield is taken by a young man of large fortune from the north of England; that he came down on Monday in a chaise and four to see the place, and was so much delighted with it that he agreed with Mr. Morris immediately; that he is to take possession before Michaelmas, and some of his servants are to be in the house by the end of next week.” GOSSIP GOSSIP GOSSIP, BUT IT SERVES TO EXPAND THE READER’S UNDERSTANDING OF THE WORLD IN WHICH THE BENNETS LIVE. THEY HAVE A NEIGHBOUR NAMED MRS. LONG, THEY LIVE IN ENGLAND, THE NEIGHBOUR DRIVES A CHAISE AND FOUR, SO THAT PUTS US FIRMLY IN A PRE-INDUSTRIAL SETTING, AND THAT THEIR NEIGHBOURHOOD IS VERY RELIGIOUS. “Is he married or single?” AH – SO NOW WE GET BACK AROUND TO THE THEME OF MARRIAGE. “Oh! single, my dear, to be sure! A single man of large fortune; four or five thousand a year. What a fine thing for our girls!” AND HERE IS THE OPENING OF THE PLOT – MRS. BENNET HAS MULTIPLE DAUGHTERS AND SHE IS DESPERATE TO MAKE SURE THAT THEY MARRY INTO GOOD MONEY. SO DESPERATE THAT SHE DOESN’T EVEN CARE IF BINGLY IS ALREADY MARRIED. THIS FEEDS RIGHT BACK TO “THE RIGHTFUL PROPERTY OF ONE OR OTHER OF THEIR DAUGHTERS”. “How so? how can it affect them?” OH, DROLL MR. BENNET! I LIKE HIM ALREADY. THE AUDIENCE NOW KNOWS WHOSE SIDE WE’RE SUPPOSED TO BE ON. “My dear Mr. Bennet,” replied his wife, “how can you be so tiresome! You must know that I am thinking of his marrying one of them.” REINFORCING THE PLOT – MRS. BENNET WANTS ONE OF THEIR DAUGHTERS TO MARRY BINGLY AND WILL DO ANYTHING TO MAKE SURE SHE DOES (AND INDEED, LATER SHE SENDS JANE OUT IN A STORM ON PURPOSE, SO SHE WILL CATCH A CHILL AND BE FORCED TO STAY OVER AT NETHERFIELD SO SHE AND BINGLY CAN HAVE TIME TOGETHER). So, you see – we learned a lot about the world by simply listening to the conversation. The plot began while we were with the Bennets in the library, we found out immediately what sort of woman Mrs. Bennet was and what her marriage is like, and we already know that the theme of the book is centered around the scramble of the poor landed gentry to marry their offspring off to advantage. None of the worldbuilding was sacrificed, but the focus was on the character-building instead. And this is a great set up, because now we know what sort of family the Bennet girls come from – when we finally meet our heroine, Elizabeth Bennet, we understand why she is so witty, frustrated with her family life, prejudiced against Mr. Darcy’s cold formality, and full of the vigor of a very busy household. Now imagine if Austen had instead opened with ten pages about how the Bennets had fallen into poverty, how in England the estates must be entailed to eldest male heirs, and how the great families are all considered cold and aloof to the lower class ones. Boring! It’s a fantastic bit of world building, but I have nobody to stand beside and care about, nobody to champion, nobody to invest in emotionally. Tell me a story about a person, start the story when the plot starts, when something in that person’s life is about to change, and I will remain engaged as a reader. And you will remain engaged as a writer, because you will suddenly have someone that you care about immensely and you will be able to keep at writing his / her story. When I talk about a character, your hero, you must imbue them with a WANT and a FLAW. Characters are flat and too perfect if they have neither of these things. The WANT drives the plot, and in fact often begins it, and the FLAW is the way that the character often trips themselves up or are tripped up in their pursuit. Mrs. Bennet WANTS her girls to marry Mr. Bingly, but her FLAW is that she’s a horrible busybody gossip who embarrasses her daughters and whose behavior drives away the Binglys. Elizabeth Bennet WANTS to marry for love, but her FLAW is that she’s prejudiced against snobs without grounds and her pride was wounded by Darcy’s harsh words. In Buffy the Vampire slayer, Buffy Summers WANTS to be a regular normal girl, but her FLAW is that she’s the Slayer and her mere existence means that the baddies of the world are attracted to her and so she can’t avoid being a Slayer. In Star Wars, Luke Skywalker WANTS to become a Jedi and save the Princess, but his FLAW is that he is Vader’s son and there’s a danger he may switch to the Dark Side. Also, he’s an undisciplined whiney brat, and that is a FLAW he must overcome within himself. You see where I’m going? The plot arises out of the clash between those wants and flaws. Your character desires something, but can’t get it. The story is about your character trying to get that thing. Author David Nickle; says: “Drama happens between people, not inside people.” And author Laurie Channer says “A Situation is not a Story.” These are good axioms to keep in mind. Character vs. Society – in which the character fights against an aspect of their own culture to achieve their want (In 1984, the protagonist fights against Big Brother to achieve freedom of thought and agency over his own life). Another great tool for building a plot out of conflict is Joseph Campbell’s Hero’s Journey. The 12 steps of the mythological hero’s journey is based on the life of Christ, and corresponds to the labours of Hercules, the deeds of Oden, the deeds of Osiris, and many other mythological heroes. There is a reason for this – these are the sorts of stories that we as human beings love to hear, and we as writers love to tell. You know who else follows the Hero’s Journey? Buffy Summers. Harry Potter. Luke Skywalker. Xander Harris. Peter Parker. Here the person is introduced to the audience. S/he doesn’t know her/his personal potential or calling. The call to adventure is the point in a person’s life when s/he is first given notice that everything is going to change, whether they know it or not. This is sometimes described as the person’s lowest point or darkest moment. The separation has been made between the old world and old self and the potential for a new world/self. By entering this stage, the person shows her/his willingness to make a change, to die and become a new person. The return with elixir is the achievement of the goal of the quest. It is what the person went on the journey to get. All the previous steps serve to prepare and purify the person for this step, since in many myths the elixir is like a plant, or a magic potion or medicine, that supplies immortality. For a human hero, it means achieving a balance between material and spiritual world. There is freedom to live and freedom from the fear of death. This is sometimes referred to as “living in the moment”. Of course, the thing with this is that it doesn’t have to be about swords and potions. It can be about marriage and love. It can be about ray guns and spaceships. It can be about self worth and bullies. A really great and compact version of a perfect Hero’s Journey is the webseries “The Legend of Neil” (warning! NSFW!). By some of the same folks who brought you The Guild, the Legend of Neil is about a regular looser who gets sucked into a game of Zelda and must learn to be a hero against his will. He WANTS to be a hero and save the Princess Zelda (so he can get laid), but his FLAW is that he’s a lazy whiner who only thinks of himself. It plays out the Hero’s Journey in an entertaining, engaging, and thoughtful way, and it’s also a really great example because it’s a completed story. Okay – so you’ve figured out who you want to tell the story about, what their WANTS and FLAWS are, the sort of world they live in, and where their major struggle will lay. Now it’s time to actually PLOT the story. As I said yesterday, there are two types of writers who do this different ways. The Planners make very detailed notes and charts about what is going to happen to whom, in what order, and why. The Pantsers have a vauge idea of what the thrust and ending of the book should be, and write without a plan, seeing where the story takes them. I’m a hybrid species, where I usually write the ending first and then go back to the beginning and figure out how to get my characters there. Exposition – in which we learn about the hero and why we should care about them. We also learn a little about their WANTS and FLAWS. Triggering Event – the event in which the hero is forced to do something or go somewhere by an outside force, that sets them on the path of achieving their WANT. Rising Action – in which the antagonist appears and proceeds to thwart the hero in pursuit of their WANT, usually by exploiting the hero’s FLAWS. The hero struggles here, and often times considers turning back. They then learn or realize that they are the only person who can stop the antagonist and go forward, and usually correct their FLAWS. 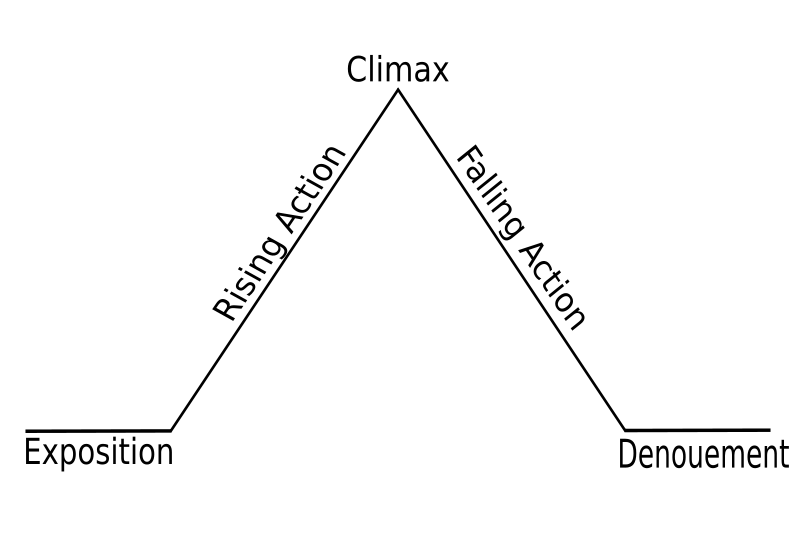 Climax – in which the antagonist is defeated and the hero achieves his WANT. Falling Action – in which the hero returns home triumphant but ultimately changed, and uses his new knowledge to benefit his society or close circle of peers. Also check out: “Conflict and Character Within Story Structure” over on the Elements of Writing a Novel blog. At every stage, ask yourself WHY. WHY is this character the one I want to focus on? WHY is that their FLAW? WHY are they struggling with that element? WHY does the antagonist want to thwart them? WHY doesn’t someone else do it instead, WHY does it have to be my hero? WHY do they need to travel there, or not travel there? Then answer that WHY within the book. And the scariest WHY of all… WHY do I feel this story needs telling? WHY do I need to sit down and spend all this time and mental energy on this narrative? My answers to that WHY are generally – a) because I want to make a comment on this or that thing, and my book will do that, b) I want to start a discussion on that theme, c) I love to tell stories and I want to tell this one, d) I love these people I have created and I want to share them with my readers, e)I might actually go crazy if I keep all these people pent up between the confines of my skull. Also check out my blog post on Why I Write.